These exponential progress curves are trend lines, not "Laws" of nature. They can flatline or accelerate without warning. Reading and writing DNA, homologous replacement of genes in living organisms, and genome sequencing (at 8-fold per year) all seem to be on even steeper exponentials than Moore's law for electronics (at 1.5-fold per year) both for cost and quality. 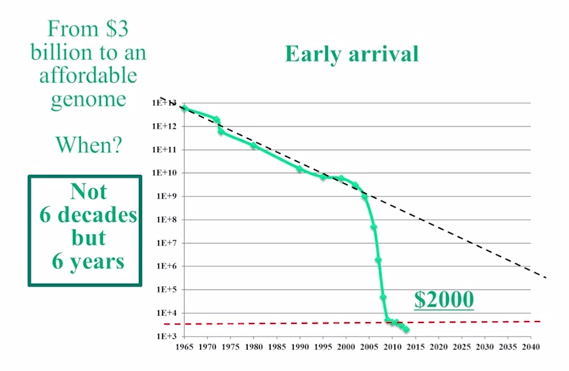 Such exponential change especially in the context of lowered costs and greater accessibility, raises questions about medical data escape/reidentification, environmental apathy vs meddling, and potential for large-scale bioerror/bioterror, equitable distribution of new technologies.. We must creatively anticipate and mitigate unintended consequences. 2013 Raw Personal Data: Providing Access and Agency. Science in press. 2012 Regenesis: How Synthetic Biology Will Reinvent Nature and Ourselves 288 pages. 2010 Personal genomes in progress: from the human genome project to the personal genome project. Dialogues Clin Neurosci. 2009 Safeguarding Biology. Seed Magazine. 2005 Let us go forth and safely multiply. Nature.